What is an iframe? And better yet, what does that have to do with either SEO or small business marketing? Let’s get to it. An iframe is an html element used to display a document within a document. Think of a Microsoft Word document displaying a second Word document within the content of that first document. Hopefully that isn’t more confusing. 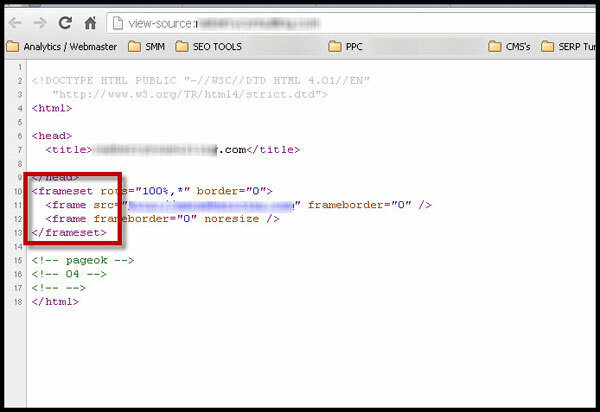 On a website, an iframe is used to display one website within another website. Sometimes a website will use these inline frames (iframes) to display another site’s content in an attempt to make a better user experience for their visitors. Unfortunately, many companies use this inexplicably to display their own content, which resides on another domain (web address) on their primary site. There are many reasons this is done, but none are good reasons, and really its lazy web development. Often what happens is a small business decides to “redesign” their website and a web developer shows them a pretty new design, but fails to teach the business owner what they’ve really done. A new design is created, but it’s only window-dressing – the old site lies underneath the new design. As an aside, businesses should worry less about the aesthetics of a site, and more on how visitors are able to interact with their content. 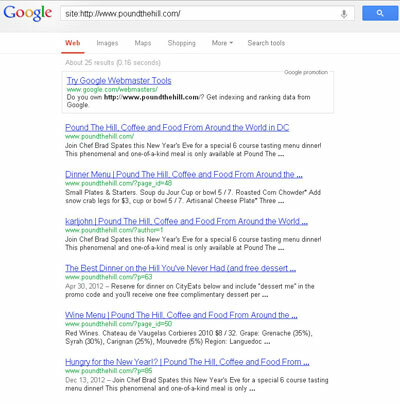 Search engines can be included in the usability argument… search engines do NOT like iframes, as Google explains here. Search engines are designed to crawl and index content on one URL (web page) only. They want you to write unique content on your site, not include the content of another site (with exceptions). How Can I Tell If My Site Is Using iFrames? What you should see when you search for your site on Google is multiple pages of results showing dozens (or more) pages on your website. Unfortunately this post was inspired by some sites I’ve seen recently which are using iframes to display content from one site onto another domain that has a “prettier” name. 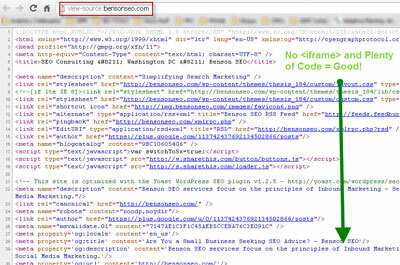 An equivalent example would be if Benson SEO was displaying content from bensoncontentsite.net on bensonseo.com, because I thought the domain name was so much better for users. Honestly, it doesn’t really matter what your site name is as long as you’re providing visitors with great content and making sure that content is accessible to search engines. What To Do If Your Site Is Using iFrames? Pick one domain and stick with it. Re-launch your site with all your content readily available to search engines and people. These are just a few tips to creating an accessible site that search engines can understand and present to people searching for the products or services your company provides. Contact us for a site evaluation and we’ll get things corrected so you have a search engine friendly website. "Benson SEO was an invaluable resource while designing our website. Scott went above and beyond to make sure we were set up to succeed! "